As I train and coach leaders, many of the questions I receive focus on small group prayer. Several years ago, I was leading a group and tried something new. 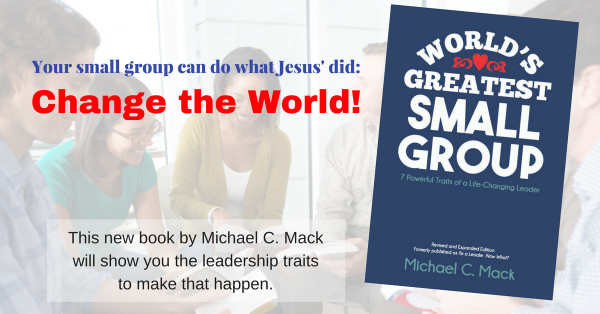 I had been studying what makes a small group “Christ-centered,” the first vital sign of a healthy small group (from my book, Small Group Vital Signs). One of the things I realized was that you can tell how Christ-centered a group is by how they pray. Does your group take prayer requests and then pray then back to God as if He isn’t present? Do people give answers or fix? These activities make it clear whose power the group members are most reliant on. If you know God is present with you and his power is with you when you meet, how would you pray differently than you do now? Here’s what I did to make our group prayer time more Christ-centered and healthy. As we enter into our prayer time, I remind group members that as we meet together in Jesus’ name, he really is there with us. I often remind them of Matthew 18:20 or 1 John 1:3, for instance. I read one of these verses and discuss the implications for our prayer time. I remind the group that as we share our prayer requests with one another, God is listening, so we don’t need to repeat our prayer requests back to him as if he didn’t hear them the first time! This simplifies prayer for many people and, at the same time, it makes it much more awesome (literally!). I ask people to share what’s on their minds and hearts with us and Jesus at the same time. If they prefer to share their request as a prayer, that is, directed to Jesus, that’s fine. The rest of the group will listen in. If they prefer to share it with group members, that’s OK, too. Jesus is present and is listening. Maybe we get too caught up in “saying a prayer” and putting it into the right format with the right words rather than simply having a conversation with one another and Jesus. Perhaps people don’t pray aloud because they think they’ll get it wrong. Talking to Jesus and one another should be the most natural thing Christ followers do in community. Make your prayer time Christ-centered! QUESTION: If you know God is present with you and his power is with you when you meet, how would you pray differently than you do now? Comment below!